We buy junk cars, vans, SUVs, and trucks and pay cash in Alaska! We provide the fastest cash for junk car service in Alaska. Alaska is rich with some of the most beautiful natural land on Earth; it is a breathtaking and majestic place. Don’t ruin Alaska’s majesty with your ugly old junk car rotting away! Instead, The Clunker Junker will pay you cash for cars in Alaska, and pick it up from your home or work completely free of charge! The remoteness and geography of Alaska can make it difficult to find a reputable buyer but by partnering with trustworthy and professional removal firms, we can collect your junk car in less than three business days in most cases, ensuring that you get paid as quickly as possible. However, parts of Alaska can still be very tricky, and we cannot guarantee we can pay cash for junk cars in all parts of Alaska, and our offers are sometimes very low due to low demand and long tow distances. Wherever you’re located in the Land of the Midnight Sun, we’ll do our best to make you an offer to buy your car. If we can’t give you an instant offer, we can usually list the vehicle for sale with our partner network which allows more buyers more time to make a bid on it. Rather than having to drive miles to the nearest junk car buyer, we can pay top dollar for junk cars from the comfort of your own home. We pay cash for junk cars in Alaska, collect your vehicle free of charge and make the whole process simple. Fill out our online form by telling us what year your car as manufactured, the make, model and specifications of your vehicle. With this information, we’ll be able to give you an accurate quote much quicker to ensure that you get paid a fair price for your junk car. Unlike other buyers who require you to transport the junk car to their yard, we’ll pick up the vehicle from your home or wherever it’s located at no charge to you. That’s the Clunker Junker promise. Save yourself time and hassle and earn a fat paycheck by selling your junk car through Clunker Junker today. Rather than getting ripped off, enjoy a big payday through The Clunker Junker. We don’t have large offices or huge junkyards, which saves us money and allows us to pay top dollar for junk cars. Whether you’re driving a Ford F-150 through the Alaskan snow or a rapid Nissan, we’re willing to give you cold hard cash for your car. How much can I sell my junk car for in Alaska? For cars that are mostly rusted out with no valuable parts in them we typically pay between $25 and $75. These vehicles have little value and are therefore priced based on how much they weigh. We’ll even pay you in cash for junk cars with no title whenever possible. You might classify your vehicle as a junk car, but if it’s still got usable parts it’s valuable to us. In this case we’ll often pay you far more than you’d get for the scrap metal value because some of the parts can often be reused or sold. While we specialize in buying junk cars, we also buy vehicles which are still trucking along even if they are on their last legs. For these vehicles we can pay up to $5,000 meaning that you might be letting a gold mine gather dust in your garage! 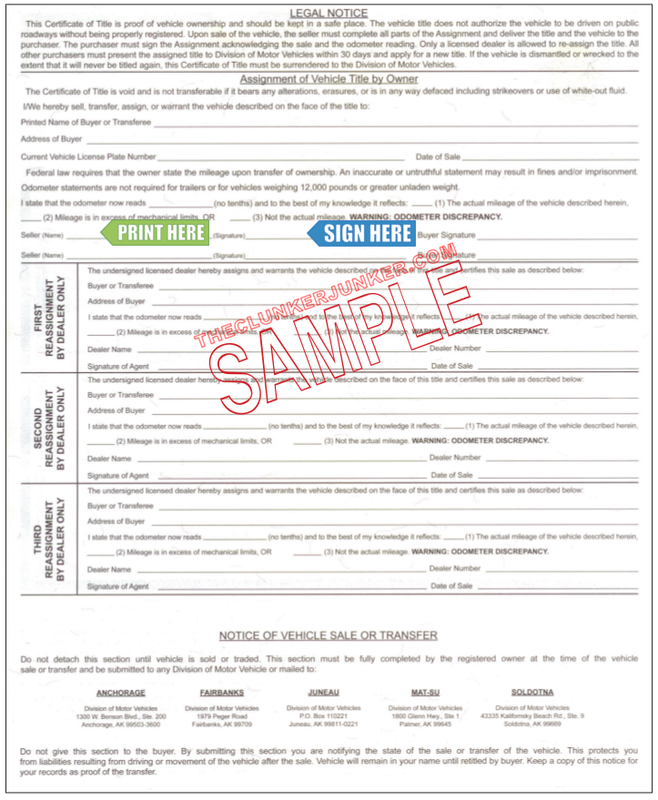 We have put together a simple guide and example for how to sign your Alaska title when you are selling your vehicle. If there are multiple owners listed on the title, they must all sign the title unless the names are separated with "OR". 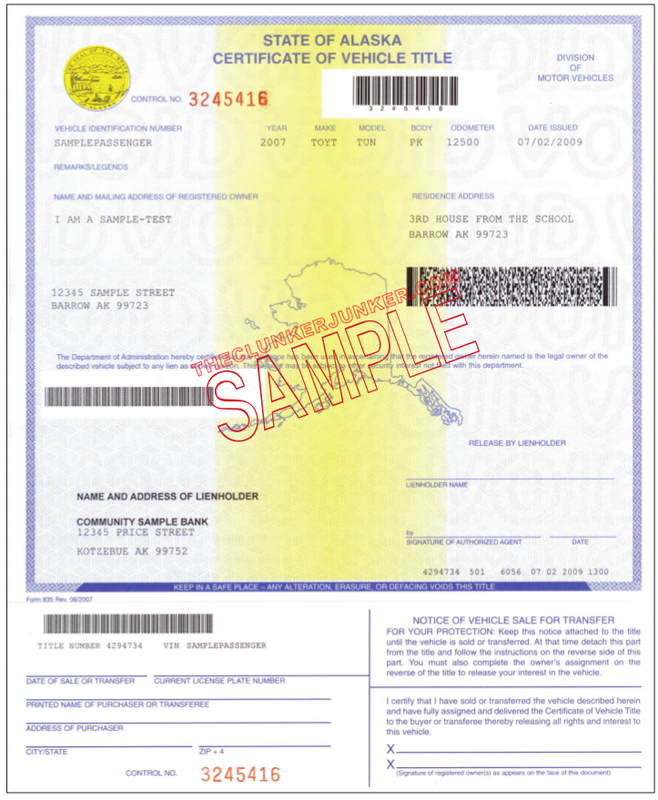 Be sure you are using the "Assignment of vehicle title by owner" section on the top of the back side of the title. Do not sign or print in the dealer only sections! Sign your name on the back of the title where it says "Seller (signature)"
Print (don't sign) your name on the back of the title where it says "Seller (name)" Always include any and all middle names or initials that are used in the owner section. 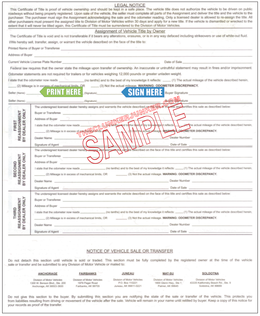 You will need to fill out the notice of vehicle sale transfer. This should be attached to the bottom of your title, but you can also find Form 820 here. Fill out the Alaska Application for Replacement Title form #809. This document must be notarized. The fee for a replacement Alaska title is $15.00. Getting rid of an abandoned vehicle in Alaska can be a difficult process. Unfortunately, you cannot just sell any junk car that ends up on your property if you do not own it. You'll need to follow the Alaska abandoned vehicle removal procedures. We have given a general overview of what that entails below. 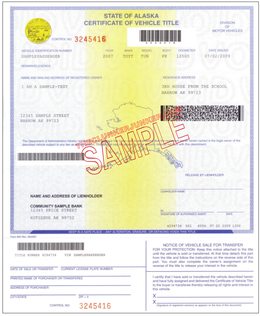 The person or entity in possession of the motor vehicle must send a Notice of Possession to the owner and/or lienholder on record via certified mail. To have an abandoned vehicle removed from your property, you must first contact your local law enforcement agency. The owner of private property where the vehicle is abandoned must request in writing to the municipality that the vehicle be removed. The State may then sell the vehicle at public auction. The buyer of the vehicle at public auction may then use the affidavit of sale to apply for a title. If a vehicle is abandoned on private property without the consent of the private property owner for (6) six months or more is presumed to be an abandoned vehicle and title to the vehicle may be transferred to the private property owner. Contact your DMV for further instructions on what to bring with you. Can you buy my junk car without a title in Alaska? No, unfortunately we cannot purchase vehicles in Alaska unless you have a valid title in hand. However, the legal owner of the vehicle should be able to easily obtain a duplicate through your local DMV. See instructions for a duplicate title above. Alaska often changes their title documents from year to year. If you have questions about your specific title, please contact your Alaska DMV. In general you want to sign and print in the assignment of title section (not dealer!) on the signature of seller and printed name of seller lines. You should also notify your local Alaska DMV that the vehicle has been sold. You could potentially earn hundreds or thousands of dollars for your junk car which is only collecting dust…or maybe snow! Don’t waste your time heading to an auto salvage yard, only to get a hilariously bad offer for your vehicle. You deserve better than that. Find out how much your vehicle is worth from the comfort of your own home, fill out the necessary documentation, watch our collectors pick up the car free of charge and get paid handsomely for your junk car in Alaska. "The vehicle has overheated, it started smoking, and it quit accelerating. I presume that the engine is blown. It started and ran after being towed home, but the oil cap must have blown off or something, because it's long gone." "The front end strut and axle need to be replaced, and I don't have the cash to replace it. I am in need of transportation to get to and from work, so I need the cash. I've replaced the radiator, alternator, brakes, serpentine belt and hoses. Also, the battery is brand new." "The vehicle has a rebuilt engine that I did for a guy who didn't pay. The engine and transmission are good with 0 miles. The vehicle also has all new internal parts. I want to junk them together or I can separate the car and the motor and transmission. " "The vehicle needs a tune up, brakes, and someone needs to disable a security cut off issue when you put the key in the ignition. It sometimes doesn't recognize the chip in the key. We bought a new vehicle, and that is why we are junking this one for some cash." "The water leaked in through the backed up water drains near the sunroof and damaged the wiring harness under the floorboards when it collected there. This ruined the wiring harness and the transmission." "I haven't used the car in two years, and I need to get it out of my driveway. It needs some work (the brakes sounds like they have rusted from sitting), and I don't want to put any cash into it." The Clunker Junker is one of the top junk car buyers in the state of Alaska. To date we have made instant offers on over 3 thousand vehicles across the state, totaling over $1 Million offered! We were not able to purchase many vehicles without a valid title. We also buy cars on a wide spectrum of conditions and 64% of the vehicles we've made offers on in Alaska do not start or drive. Many also have moderate to severe body damage. Anchorage in Anchorage Municipality was our top producer, followed by Wasilla.